1. Civil and criminal motions are heard on Monday at 10:00 a.m. If Monday is a holiday, the next motion date is Tuesday following the Monday holiday. It is not necessary to clear a motion date. ivil and criminal motions are heard on Monday at 10:00 a.m. If Monday is a holiday, the next motion date is Tuesday following the Monday holiday. It is not necessary to clear a motion date. 2. Discovery motions are to be calendared before the Magistrate Judge. Civil and criminal trials are held Monday through Friday from 8:30 a.m. to 11:30 a.m. and from 1:00 p.m. to 4:00 p.m. Motions in Limine are heard at the beginning of trial. See the attached Initial Standing Order for further procedures. Tentative rulings are not issued. Ex Parte Applications are not noticed for any date or time certain. If a hearing is necessary, the courtroom deputy clerk will contact counsel. One mandatory chambers copy, blue-backed and two-hole punched, is required for each e-filing, with the date and time of the e-filing indicated on the face page. The chambers copy box is located outside of the Clerk's office, on the 4th floor. Request for Continuance of a scheduled court proceeding is not automatically granted. Refer to Local Rule 52.9 for proper format. Counsel are not to initiate telephone calls to chambers unless first contacted by a law clerk or Judge Otero's assistant. Inquiries regarding the status of a motion, stipulation, or proposed order are not handled telephonically. Counsel may sign-up for Pacer access to monitor the clerk's database. See PACER. For general information on how to order a transcript of any reported or digitally recorded proceeding, please contact 213-894-3015 or visit the court website (www.cacd.uscourts.gov) section referring to Court Reporter/Recorder Transcripts. If you require an estimate of cost for the preparation of a transcript, contact the court reporter/recorder for the desired proceeding. To determine the court reporter/recorder for a particular proceeding, go to the Court Reporter Schedule web page and click on View by Date. Once you've determined the correct court reporter/recorder for the desired session, click on Court Reporter Phone and Email List for contact information. Law Clerk and Extern Applicants may submit applications to District Judge S. James Otero, United States District Court, Suite 244P, 312 North Spring Street, Los Angeles, California 90012. Include a cover letter, resume, transcript, and writing sample. Letters of recommendation are to be directed to this address. Interpreter: Obtaining the services of a certified interpreter on a civil case is the responsibility of counsel. For information, dial (213) 894-4599 or check the court's website at www.cacd.uscourts.gov > General Information > Interpreters. Please see the attached Civil and Criminal Initial Standing Orders for detailed procedures regarding cases assigned to Judge Otero. Counsel are advised to regularly check for updates. Counsel are directed to comply with all Local Rules. If counsel have received a "Notice to Parties of ADR Program" (form ADR-08, ADR-10, or ADR-11 with attached "ADR Program Questionnaire" form ADR-09), please see the section on the Court's website entitled "ADR," General Order 02-07, for further information. The ADR section also contains Attorney Settlement Officer information. Arrangements for bringing voluminous exhibits into the courtroom may be made through the Space and Facilities Help Desk, at (213) 894-1400. For information regarding ELMO reservations and/or training, please visit the court website the court website (www.cacd.uscourts.gov) section referring to Courtroom Technology. Alternatively, you may contact the Courtroom Technology Help Desk at 213-894-3061. UNDER SEAL DOCUMENTS: For civil matters please refer to the Court website regarding Guide to E-filing sealed documents : http://www.cacd.uscourts.gov/court-procedures/filing-procedures/sealed-documents. 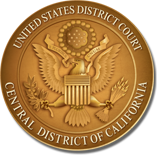 For criminal matters Judge Otero is participating in the Central District of California’s Pilot Project for the Electronic Submission and Filing of Under Seal Documents. The Pilot Project applies to both civil and criminal cases.Judge Otero is participating in the Central District of California’s Pilot Project for the Electronic Submission and Filing of Under Seal Documents. The Pilot Project applies to both civil and criminal cases. Parties shall make every effort to limit the number and volume of under seal filings. In most circumstances, parties should seek to file under seal only the specific exhibits or documents for which there is a valid basis for filing under seal. When seeking the Court’s approval for an under seal filing, the submitting party shall electronically file an Ex Parte Application to Seal and proposed Order through the Court’s CM/ECF System pursuant to Local Rule 5-4. The Ex Parte Application and proposed Order shall not contain the information the party seeks to file under seal. The party seeking permission to file under seal shall submit to the Court’s generic chambers e-mail address (sjo_chambers@cacd.uscourts.gov) PDF versions of the Ex Parte Application, proposed Order, Declaration in Support of Ex Parte Application stating the reason for the under seal filing, and the document(s) and/or exhibit(s) the party seeks to file under seal. The party shall also submit a Word or WordPerfect version of the proposed Order to the generic chambers e-mail address. Unless otherwise ordered by the Court, the submitting party shall deliver a Mandatory Chambers Copy of the Ex Parte Application, proposed Order, Declaration in Support of Ex Parte Application, and the document(s) and/or exhibit(s) the party seeks to file under seal to the Court’s courtesy copy box located outside chambers no later than 12:00 p.m. on the following business day. The Pilot Project for the Electronic Submission and filing of Under Seal Documents does not apply to in camera submissions. Unless counsel or parties have been expressly authorized to communicate with chambers, all appropriate oral and written communications are to be submitted to the Courtroom Deputy Clerk. (See Local Rules). ​One mandatory chambers copy, blue-backed and two-hole punched, is required for each e-filing, with the date and time of the e-filing indicated on the face page. The chambers copy box is located outside of the Clerk's office, on the 4th floor. CRD prefers to be contacted by e-mail.